From the moment you step off the plane you'll know that you're in Samoa. Those unbeatable tropical balmy nights, music and dancing Samoan style, topped with tattooed men and women, all combining to put you in a state of awe and excitement, and leaving you with a feeling that you may never leave our shores or Coconuts Beach Resort. Samoa is, and wants to remain, different: a quiet destination, a traditional destination and a beautiful destination. Coconuts offers a number of different types and styles of accommodation, from extremely spacious Garden Suites and Tree House Rooms, to perfectly situated Fales and Villas directly on the beach - or even over the water in the crystal clear lagoon! All of our suites, rooms and fales have been designed to fit into and reflect the paradise of Samoa that surrounds them. All are finished in fine, local materials and feature both air conditioning and ceiling fans, coffee/tea making facilities, electronic in-room safes, hairdryers and mini-refrigerator. No matter what type of accommodation you choose for your relaxing retreat at Coconuts, you won't be disappointed! Situated directly over the water with fantastic panoramic views, these one bedroom bungalows feature a king size bed, sitting area, private bathroom facilities with oversized bathtub and separate shower, and a large outside deck. Finishing touches include thatched roofs, island decor and a glass bottom area to view the sea life. These fales are unique in Samoa & absolutely sensational! Located directly on the beach, these are one or two bedroom fales, both featuring a split-level design and a separate sitting room. Unique "open air" bathrooms have lava-rock walls, tile floors, and a sunken bath/shower nestled under a lava-rock waterfall. The one bedroom fale offers a king size bed, the two bedroom a king size bed in one room and two twin beds in the other. Finishing touches include thatched roofs, bamboo trim work & island decor. Conde Nast Traveler said that Coconuts had "the most delightful rooms in Samoa" and we are proud to announce that our newest accommodations - The Royal Beach Villas - are no exception. These are the most spacious suite of villas available in all of Samoa, if not the entire South Pacific: this complex of three villas is comprised of two one-storey beach villas (Villa Pule and Villa Ali’I) flanking an immense, two-storey central villa (Villa Matai). The two flanking villas each total over 600 sq. ft, including bedroom, sitting room, walk-in closet, writing alcove and large open-air style bathroom, complete with lava rock "waterfall" shower. The central fale is more than twice as spacious, and includes these same features as well as a second storey Observatory and balcony, accessed via a circular staircase, which can also serve as additional sleeping quarters. All three villas are architecturally unique with exterior walls of the living and bedrooms constructed entirely of poles and glass, split level design, exposed-beam pole ceilings and 180 degree views enhanced with local hardwoods, finely crafted lava rock walls and beautiful quartzite tile. These villas are connected via covered bridge, and can be booked as an entire suite or individually, making it perfect for anything from one couple to families or groups of up to ten people total. 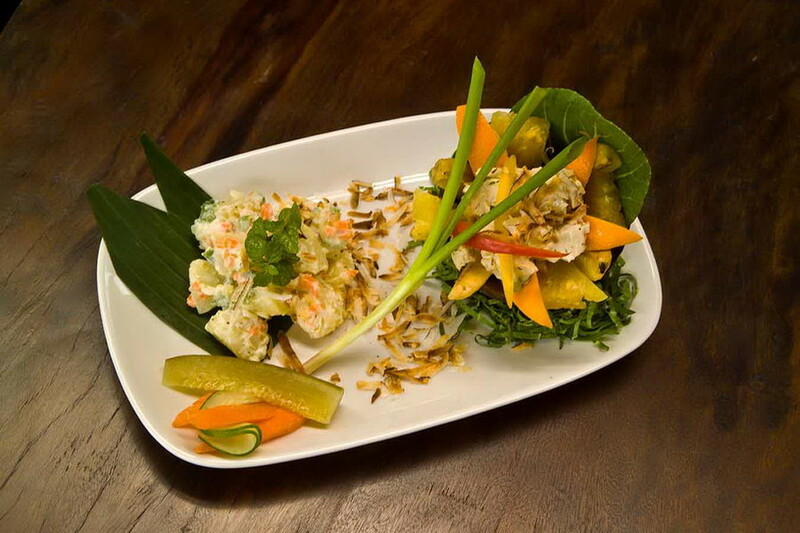 This is the ultimate in Polynesian style with a touch of high class! These suites are ideal for a couple seeking outstanding space and amenities, or for two couples or a family traveling together. Each spacious two room, two bath Garden Suite is comprised of a full-size bedroom with a king size-bed, and a full-size sitting room with convertible sleeping for one or two additional adults. Large, folding louver doors between the two rooms can be opened to create a spacious feeling if the suite is being used by just one or two people, or these doors can be closed to provide the privacy of two rooms if three or four people are occupying the Suite. Each bedroom and sitting room has its own ensuite “open air ” bathroom (two full bathrooms!) featuring Coconuts’ original, famous sunken tub with lava rock “waterfall” shower. All Suites have their own, individual slate covered terrace area, with an area for sunning and an area with a translucent cover for rain and sun protection. Beautiful teak and bamboo furniture and local materials compliment the extensive lava rock walls, creating a distinctive, Polynesian atmosphere. Although these are called "Garden" suites, many of them have wonderful ocean views from the rooms or terrace. Our famous, two-story, ocean view "Treehouse" building, with its jungle and treetop entrance, features spacious upstairs or downstairs rooms with Polynesian decor and enormous decks with chaise lounges and hammocks facing the ocean. 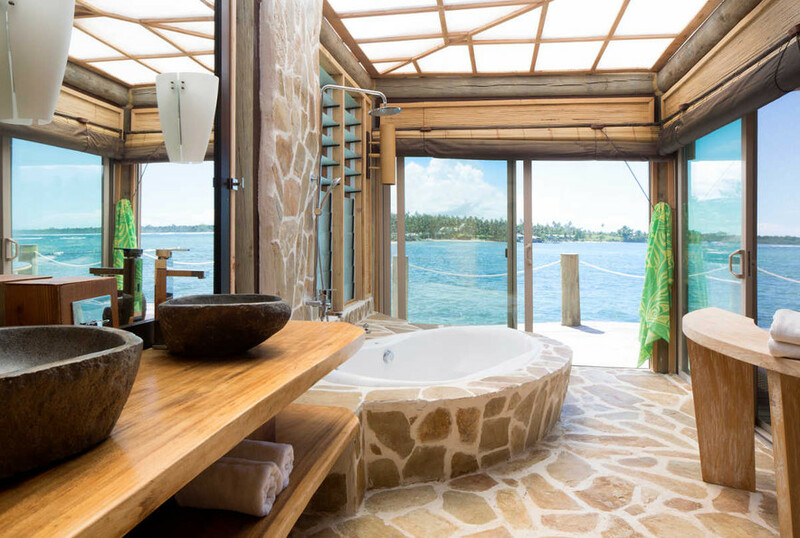 Uniquely styled bathrooms feature a two-person bathtub with a view. A favorite with Returning Nuts, these rooms are available with either one king size bed or one double bed and one twin bed. Coconuts has a small but notable history of surfing visitors, who ventured to Samoa to take advantage of the great waves and total lack of competition to enjoy them. In the past years, several "surfing camps" have opened in Samoa, but those who prefer a bit more upscale comfort, things like air conditioning and an excellent ala carte menu; like our pool for spouses or traveling partners to enjoy and tap water that's safe to drink, tend to gravitate to Coconuts. Our laid back atmosphere suits them perfectly, our location is, quite frankly, incomparable and, when everything is considered, our rates can be just about the same. Much of the surf in Samoa tends to be reef break, and many of the breaks must be accessed by boat (or very long paddles). To help you find your way to and around the waves, Coconuts can arrange for surf guiding. The guides we use have their own boats, are top flight surfers themselves, and know what's happening where and when. Contact us for more details! There are several great breaks within paddling distance of the hotel and even more a short boat ride away. Directly in front of the hotel, about 300 meters out, is a very nice right aptly named..."Coconuts"! Further west along the edge of our turquoise lagoon are two or three other breaks. One, named "Catapult" after one of the favorite (and most potent) of Mika's tropical cocktails, is a thick and mean right; another, called Tafitoala, is a popular left. Heading east down the beach from Coconuts are at least two more breaks,including a left called Siumu, lying offshore from the village of the same name. This is a good paddle from the beach, out a reef cut with a strong, outgoing current. A short boat ride further east down the coast, off of the Aganoa black sand beach, are two more great breaks, a left and a right. Both of these are an easy paddle from the beach if you choose to approach by car. The left, called Boulders, is one of the most popular in Samoa. Of course, in Samoa, that sort of popularity only means that you might see someone else out there once every odd Saturday! Aganoa beach is also a great, sandy bottomed swimming beach, with beautiful snorkeling reefs on each side of it's small bay and virtually no currents. Naturally, elsewhere on the island, there are dozens of other known breaks, and probably just as many undiscovered or "secret" ones. Most of these are accessible by car and besides being great rides, are set in spectacular surroundings. Check out Tiavea, a tiny village on the northeast corner of the island, a half hour drive from the main road down a rough dirt track, in a beautiful little bay.